Bamboo Muse was inspired by a visit to Huntington Gardens in Pasadena, CA. The Huntington features Japanese and Chinese gardens that are separated by quiet walkways through dense stands of bamboo. I was impressed by the beauty and grandeur of these amazing grasses, some of which stand as high as 100 feet tall. In Bamboo Muse, I tried to capture the essence of the towering bamboo and the light filtering through the swaying stems and leaves. The word "muse" in my title actually refers to my inspiration when I began working on this piece, though it is intentionally ambiguous whether I am also referring to the woman pictured in the garden. 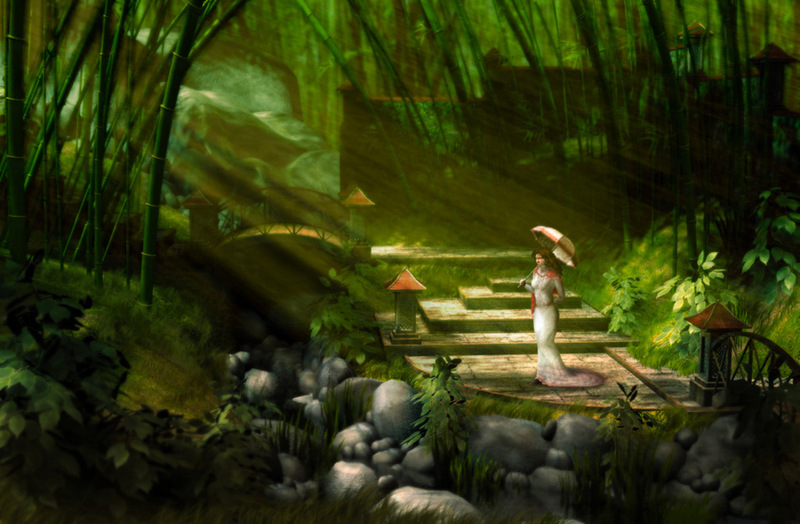 Bamboo Muse was created using TrueSpace and Photoshop, and is a 2D/3D composite. 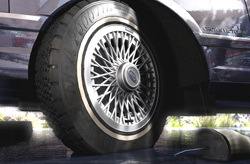 The scene itself was modeled in 3D and rendered in sections, then assembled. An additional rendering pass captured the light filtering through the leaves (using a volumetric effect with all other scene geometry rendered in black). The lighting pass gave me more control over the final filtering effect when the two renders were married in Photoshop. The woman was rendered in the 3D scene as a stock mannequin figure holding an umbrella to establish proportions, lighting, and shadows, but the details of her dress were "painted" into the final artwork by hand using a variety of Photoshop tools.